Three Kennedy Health associates, including Colleen Farnum of Medford, have been named recipients of the 2016 Kennedy Nursing Scholarship Awards. This scholarship program not only enables Kennedy nurses to advance their educational status, but also supports non-nursing Kennedy associates wishing to pursue a career in nursing. 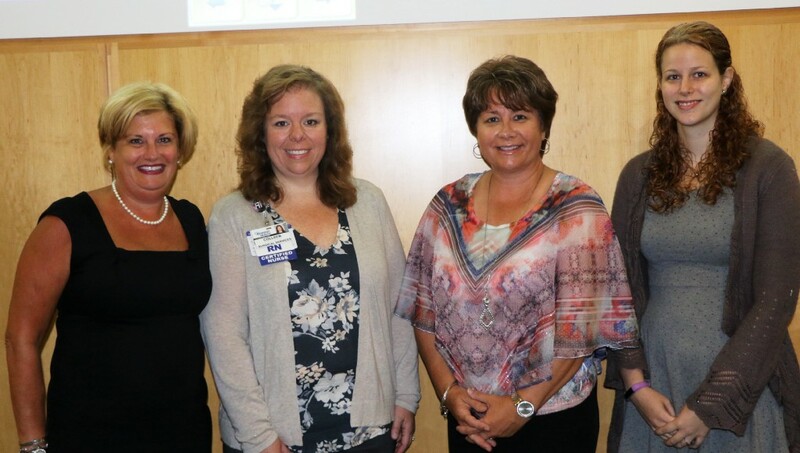 “Each of the selected recipients has demonstrated their commitment to Kennedy Health’s mission and vision, along with a passion for their own professional development,” said Helene Burns, MSN, RN, NEA-BC, Kennedy’s chief nurse executive. Colleen Farnum, RN, CPAN, of Medford, assistant nurse manager at Kennedy University Hospital in Cherry Hill. She received the Gartzman RN to BSN Scholarship, which awards up to $4,500 to current Kennedy RNs aspiring to earn a BSN degree. Farnum is pursuing her BSN degree at Grand Canyon University. The Gartzman Fund, established in memory of Dr. Alan Gartzman, a young Kennedy physician who died in a car accident in 1985, provides funding for the RN to BSN Scholarship. Alan Gartzman’s son, Steve, who attended the awards presentation, said his father “always recognized the importance of the entire medical team, especially the nurses,” adding that the Gartzman Fund was pleased to offer its support to the Kennedy Nursing Scholarship Program. Holly McDaniel, PCT, of Gloucester City, patient care technician at Kennedy University Hospital in Washington Township. She received an Entry-Level Scholarship, which awards up to $12,000 for Kennedy associates aspiring to a Bachelor of Science in Nursing degree (BSN). This scholarship type was open to all associates, in both clinical and non-clinical roles. McDaniel is pursuing her BSN degree at Philadelphia’s LaSalle University. Maria Gagliardi, BSN, RN, of Sewell, Clinical Nurse at the Kennedy Surgical Center in Washington Township. She received the Leadership Scholarship, which awards up to $8,000 to current BSN- and MSN-level nurses aspiring to earn Master of Science or Doctorate in Nursing degrees, respectively. Gagliardi is pursuing her MSN degree from Thomas Edison State University. About Kennedy Health: Kennedy is a health services delivery system serving southern New Jersey. Kennedy meets the community’s healthcare needs at its hospital campuses in Cherry Hill, Stratford and Washington Township, NJ, and at outpatient facilities and medical practices throughout Camden, Gloucester, and Burlington counties. Kennedy has more than 4,600 associates and over 900 Medical Staff members.